Hanging over a dangerous precipice, flailing wildly in the wind, with wooden steps cracking forlornly under your feet and falling beautifully into the pitch-dark abyss once you leave them behind, such suspension bridges are long in the past or left only in Hollywood movies. European suspension bridges of today are steel monsters that are absolutely safe and secure, especially if we speak about the Swiss ones. Whether you are a hiking aficionado or simply a leisurely walker who revels in the scenic outdoors, Swiss suspension bridges offer an unforgettable experience. Here is an overview of some spellbinding and occasionally vertigo-inducing itineraries. The newest suspension bridge was opened on 29 July 2017 near Randa in Valais, Switzerland. It is currently the world's longest Tibetan bridge: 494 meters long, hanging 85 meters high above the ground and 65-centimeter wide highway, linking Grächen to Zermatt on the route of the Tour of Europe, that was cut off by a landslide in 2010. In those sad seven years, hikers had to detour around the valley on a two-day hiking route in southern Switzerland. Now the journey is amazingly short. Europaweg was built in just two and a half months. Projects that aim to establish new records on this subject are numerous on various continents. There is another project underway in Italian Switzerland to build a 680-meter long structure between the two sides of Val Colla (Epa). 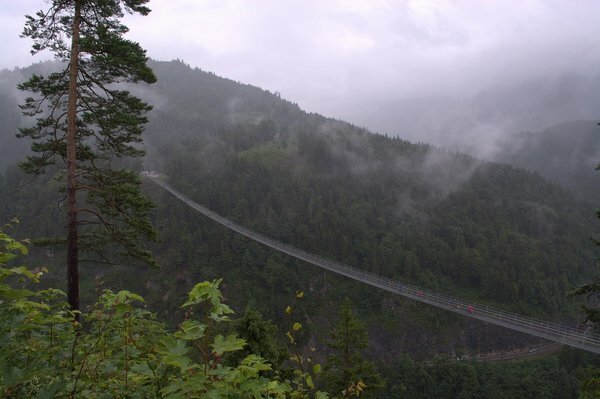 Before the Europaweg, the Raiffeisen Skywalk suspension bridge was the longest. It is right beside the Stuckli Rondo gondola station in Mostelberg and stretches over the Lauitobel Valley linking Mostelberg with the Mäderenwald forest. The skywalk reaches heights of up to 58 metres above the Lauibogel gorge and it is 374 meters long. The bridge offers a fantastic view of the Ägerital and also opens up the Mäderen-Spilmettlen hiking area. To go there, take the cable car with gondolas that can rotate around their vertical axis two times on the ascent to Mostelberg. Kids also would enjoy the Mostelberg mountain station with its attractive bouncy castle, trampoline, and a large digger. This is also the start of the channel for the summer toboggan run with its tunnels and steep-walled bends. Technically speaking, the Alp’s second longest suspension bridge is not in Switzerland, but the one in Austria. It is the bridge called Highline 179 in Reutte, close to German-Austrian border. It connects the Ehrenberg Castle ruins with Fort Claudia. The 1.2-metre-wide bridge, which has a length of 406 meters and a height of 114.6 meters, snatches the title from Japan's Kokonoe "Yume" Grand Suspension Bridge. The Highline179 is named after the tourist route that winds through this part of the Austrian state of Tyrol. Building bridges that span some dangerous gorges looked far too bush-league for the creators of the Walk. So, the men decided to aim as high as 3,000m a.s.l. and connect the two mountain peaks. The bridge opened in October 2014. The 107-metre-long structure connects View Point peak with Scex Rouge peak in canton Vaud. The bridge spans over Glacier 3000 in the Bernese Oberland. The Walk is merely 80 centimetres wide (31 inches), but it is designed to survive extreme weather conditions such as heavy snow and 200km/hr alpine winds. It partially has glass floor, so you can gawk at the drop below. 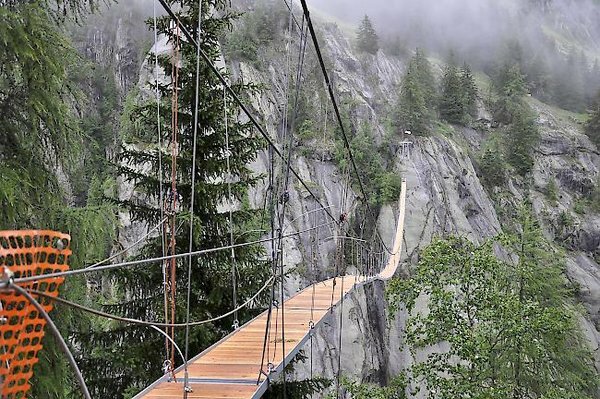 It is open in any weather, rain or shine, and despite the multimillion-franc construction costs, traversing the Peak Walk, as with all suspension bridges in Switzerland, is free. Even though it is strong enough to support 300 people, the number of visitors allowed at a time is limited to 150. The brave souls crossing the walkway are rewarded with celestial views of the Alps, taking in the iconic Matterhorn, Mont Blanc, Mönch, Eiger, and Jungfrau, and many other peaks. If you want to know which ones, switch on your PeakVisor app and get all the names and basic stats for the panorama around you. You can access the bridge from the View Point station at the top of the Glacier 3000 cable car, situated above the mountain resorts of Les Diablerets and Gstaad. One of the most mind-blowing bridges that is swaying gently 500 metres off the ground at an altitude of 3,041 meters above sea level, the Titlis Cliff Walk above Engelberg in Canton Obwalden is Europe's highest suspension bridge up to date. It was built in 2013 to celebrate the 100th anniversary of the opening of a cableway that joined the towns of Engelberg and Gerschnialp. The journey to the bridge is a challenge in itself that is kind of prepping you up for what it is. The bridge is 90cm wide and 100m long, it stretches spectacularly from one rock face to the other and requires a good head for heights and a nerve of steel as it sways in the wind and wobbles as you walk across. Once you arrive by a cable car, were is Südwandfenster viewing platform that shows off a beautiful panorama of the surrounding mountains and even glimpse parts of Italy. You can see the massifs of the Bernese Oberland, Finstaarhorn, Wetterhorn, Schreckhorn and the famous peaks of Eiger, Mönch and Jungfrau. To the south are the peaks of Sustenhorn and Dammastock with its vast glaciers. To enhance your panorama experience, use the PeakVisor app. The cable car is also worthy mentioning, it is slowly rotating on an axis while ascending which makes you lose a sense of direction on where you are heading. Hence, it might feel as if you were suspended in air, lifting and drifting aimlessly amidst the mountains and clouds. 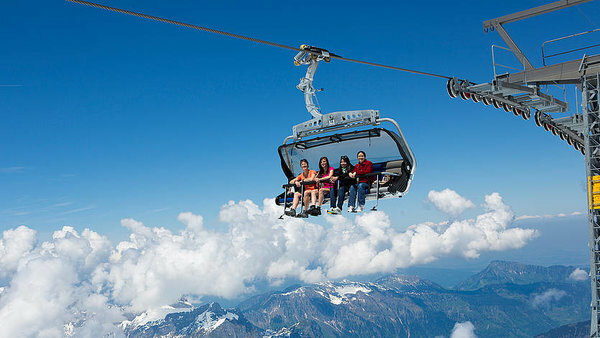 The top station of the cable car way is a five-floored edifice with restaurants, viewing platforms and a long Ice Tunnel called the Glacier Grotto, dug deep into the body of the glacier, approximately 25 meters below the surface. You walk along a path inside the core of the glacier. The temperature under the solid mass of ice is about minus 1 degree Celsius throughout the year, so it is freezing in there. The path is slippery and you need to tread very carefully. Also, you need be appropriately dressed – exactly as you would do if you were going for a stroll into a giant nebulous freezer. Moreover, the ‘Ice Flyer’ bench does not stop for you to get into. You stand gingerly in the designated place, the bench comes from behind and bumps into your booty, you plop into the bench and then before you realize it, you find yourself gently soaring – more like flying over the glacier. And I am not exaggerating one bit! The ‘Ice Flyer’ literally scoops you and takes you ‘flying’. Entry to the Cliff Walk is free of charge because it is kind of included in the roundtrip ticket to the mountain, but beware of the five elements, the bridge will be closed in bad weather. For thrill seekers who love heights, this bridge is sure to be a highlight on your trip to Lucerne. Up and up you go, and when you get over that final rock, just don't look down! It is so vertiginous you might want just to crawl back on your trail. But let fear not stop you, this is the Bridge to walk! 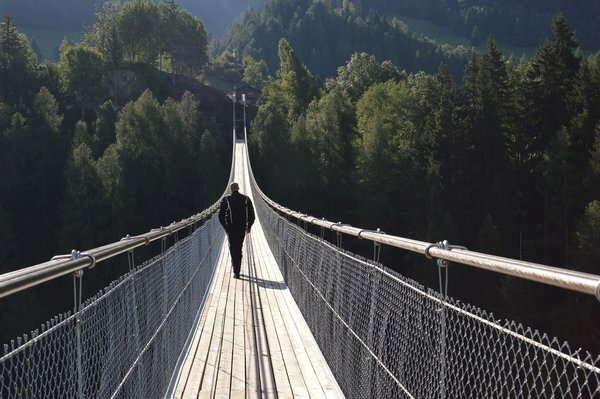 Trift Bridge in the canton of Bern was completed in 2004 and should be on everyone's bucket list! It takes a nerve-wracking ride on an aerial cable car and then a mesmerizing 2-hour-uphill hike to reach this 170m long and 100m high wonder of human engineering, but it's worth it. It hangs above the Trift Glacier which is melting at a worrying speed. 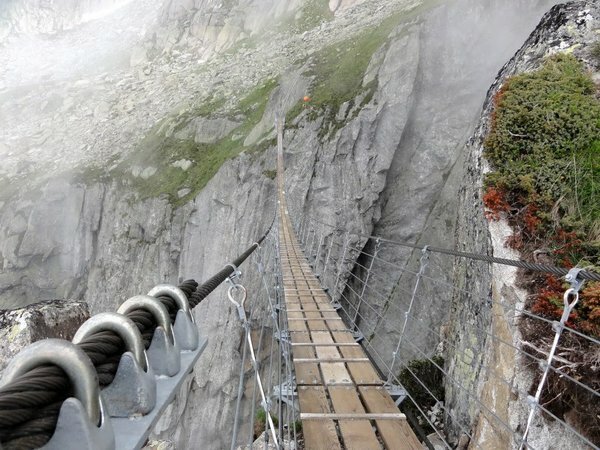 Actually, the bridge was built as a response to global warming -- until recently, the mountaineering hut of the Swiss Alpine Club at the top of the glacier could be reached on foot, but when the glacier started to shrink, the bridge became the only route of access. There was the first pedestrian bridge built in 2004 that spanned the lake providing access to the hut. It soon became so popular that it had to be replaced in 2009. The Trift Bridge of today was designed in the traditions of Nepalese three-rope bridges is accessible from June to October. The Panorama Bridge in Sigriswil spans 340 meters at a height of 180 meters above the Gummi Gorge. It is one of the many attractions of the Panorama Lake Thun trail. It links the village of Aeschlen and Sigriswil and the locals use this bridge as a short cut to get across town. It has has become the new school route for children, with access to the bus connection from Sigriswil. Tourists will find this a quiet place for a relaxing walk with spectacular views of Lake Thun and the Neisen Mountain. There is a plan to create a continuous circular panoramic path around Lake Thun with up to seven new footbridges – three have already been built. The suspension bridge over the Gummi gorge near Sigriswil is the centrepiece of this hike down to Oberhofen on Lake Thun. The bridge is open all year round, if the snow is light, but mainly the 1h 40min hikes are taken March to November. The ascent is 50 m, whereas the descent drop is 280m, so if you have issues with blood pressure, go slow. It costs CHF 8 to cross the Gummi gorge suspension bridge (hotel and holiday home guests and VCS (ATE - Swiss Association for transport and environment) members pay half price; take identity documents). Should you feel there is no adrenalin rush if you just walk Sigriswil, try to follow Freddy Nock’s steps, but only after many years of training. If you get that wobbling feeling after walking the bridge, relax in the 13th century Oberhofen Castle that is on Lake Thun. Or go as far as Schynige Platte to experience Lake Thun from afar. It would also take you high above the ground but without any precarious rope-walking. 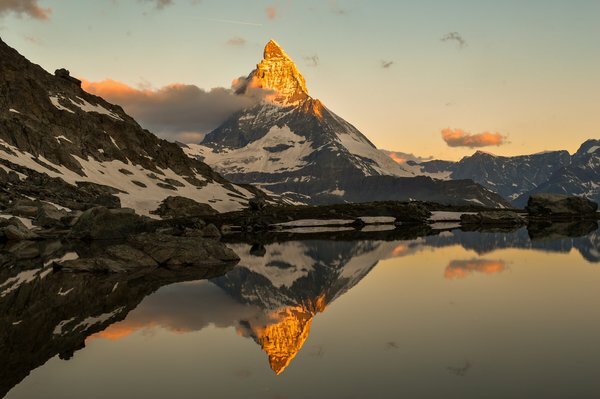 Zermatt is the starting point for many mountaineering trails to Matterhorn, the signature mount on the Swiss Toblerone and the PeakVisor app, as well as a route around the five Swiss lakes. The suspension bridge soars 90 metres above the Gornerschlucht gorge. You can hike up to the suspension bridge or take a gondola at the south end of Zermatt to the Furi exchange station and walk the 100-metre long bridge made of steel lattice and cables. It’s completely safe to cross but may require a little courage if you are afraid of heights. From the suspension bridge, you can continue to walk down toward the Gornerschlucht gorge and enter it from the top. You will pass by a glacier garden and even a playground that is fun for all ages. Mind you that the suspension bridge is closed in the winter. The best season to visit is June to October. This one may prove tricky if you drop at the vineyard first. La Vigne à Farinet (1980) is the smallest registered vineyard on Earth (1.67 m2). Originally owned by Abbé Pierre, it now belongs to the Dalai Lama. 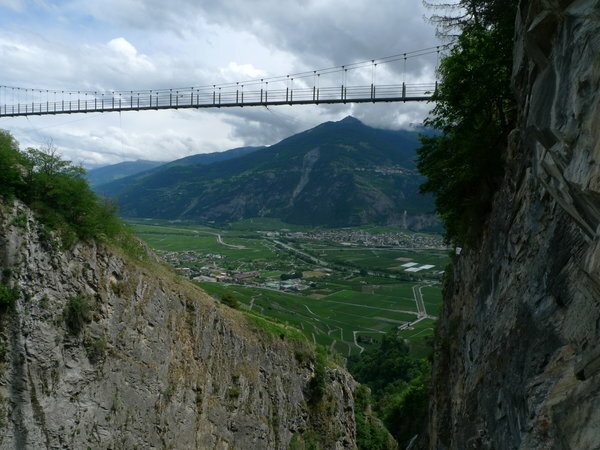 La Passerelle à Farinet (2001) is a pedestrian bridge that spans the Salentze gorge where Farinet passed away. The vineyard is made of only three vines and each year famous personalities work the vineyard. The harvest is later mixed with the best wine from the region to produce one thousand bottles which are sold for a charitable cause. This suspension footbridge has been opened since 2001 and has a height of 140 metres and is 98 metres long allowing passage over the gorge. You can access the bridge through the village of Leytron or the medieval village of Saillon. It is about an hour walk from the village through the vineyards to reach the bridge. The trail is well marked and be sure to look for the “Vine of Peace” metal artwork by Hans Erni that is sealed in the rock upstream from the bridge. Access is free and the view of the vineyards and the gorge are breathtaking. In front of the bridge, you find a small picnic area with seating and table. In-depth views down into extraordinarily narrow gorge are truly impressive. The descent leads first through the woods, then once again through vineyards and on to Saillon in around 50 minutes. Please take the time to contact the local information centre and enquire about route and weather conditions before setting off. Your intended trail may be fully or partially closed, depending on the time of year and weather conditions. Nepal-style trekking...over a 90-meter long and 64-centimeter wide hanging bridge by Salbitschijen, which joins the two Salbit and Voralp (pre-Alp) SAC mountain huts. The talk is of an unbelievably spectacular mountain trail at 2380-meter a.s.l. altitude, amid the wild and rugged scenery of the towering Salbitschijen granite rocks, together with views of the Dammakette glacial world and Sustenhorn. You can’t get much closer to that thrilling Himalayan-bridge feeling than this ... unless of course you’re there! Salbit hiking trail is a very demanding 4.5 – 5.5 hours’ hike and it is recommended to stay at one of the mountain huts. It is also advisable to rent a climbing safety belt and plan carefully for the hike as it is Nepal-style trekking. Opened in August 2016 and lying at the foot of the Fiescher Glacier, the 160-metre long Aspi-Titter bridge made of wood and steel represents the missing link in a continuous high-level mountain trail between the Gotthard and Lake Geneva. In the heart of the UNESCO world heritage site, it’s not only a direct connection between the two villages of Bellwald and Fieschertal, but also joins the Aletsch region with the district of Goms. Aspi-Titter Bridge spans over the 120-metre deep Weisswasser gorge. Whether on a day trip or a multi-day hike, you can be sure of a thrill. AND, you can become the bridge owner just for 100 CHF! You can buy a bridge step and as a special thank you, the organisers will carve your name into a wooden step and you will receive a personal certificate of ownership. By donating to the Aspi-Titter Hängebrücke you not only immortalize yourself but you also contribute to a unique project in our region. What’s more, the purchase of a bridge step is considered a donation and can be deduced from your income taxes in Switzerland. Isn’t it a wonderful ‘once-in-a-lifetime’ gift? Just make sure you check the weather first before setting off as the intended trail may be fully or partially closed, depending on the time of year and weather conditions. San Barnàrd church and Carasc Bridge in the restored Ticino village Curzútt (Corte di Sott), get the vertiginous effect while crossing the 270-meter-long and 130 meter-high Carasc suspension bridge. The bridge joins the stone made village of Curzútt S. Bernardo to the hiking path of “Via delle Vigne”, permitting pleasurable hikes amid chestnut woods in a historic, scenic and beautiful region known for excellent food and wines on reaching the other side. The suspension bridge is easily accessible with the Monte Carasso-Carzùtt-Mornera cable car – the valley station for which is located on the outskirts of Bellinzona. After passing the upland plain of San Defendente with a late medieval oratory, the route follows the old stone path that descends very steeply to Sementina and Monte Carasso. At the end, walkers will see the "Fortini della fame" (circular "hunger" towers) on the left, the Dufour defense line and the SS. Trinità church. Goms Bridge near Ernen is 280 m long and 1.40 m wide. This suspension bridge crosses the young Rhone at a height of 92 m. The bridge is open all year round except after heavy snowfalls. Walkers pass wooden water conduits to reach the awe-inspiring columns of the Ernen gallows. In 1447, the high court for the entire tithing of Goms was assigned to Ernen. Not all thieves were immediately condemned to death here: most of them escaped with prison sentences or fines, while some were put in the pillory or branded on the shoulder. Here you can also see a lovely church and Tell House with probably the oldest Tell frescoes (dating from 1578). Goms Bridge allows direct access from Fürgangen to Mühlebach village with Switzerland's oldest wooden village centre complex.